Product Empties Volume 6 | Vanity and Everything in Between. An empty product will always be rewarding for me (for the most part). I may have my favourite brands but it's mostly because of a matter of preference. It doesn't necessarily mean that I never try other brands. As I've said dozens of times before, I alternate the products I use bi-monthly. Now, I'm trying to alternate on a monthly basis just to give enough time for me to really really like a product. Sometimes it's a hit. Sometimes it's a miss. We did a little bit of spring cleaning yesterday. It was something random, actually. 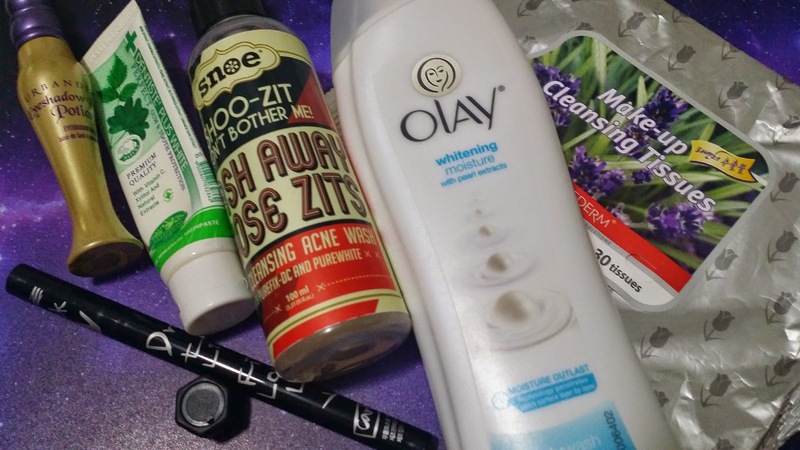 So, I "cleaned" my vanity and toiletries and saw a few products that I recently emptied! Hurrah! 1. Urban Decay Potion Primer in Greed - I used to love this product and even considered this as G for the longest time until it just stopped working on me. All of a sudden, my eyeshadows don't blend well anymore when I'm using this. It's like the eyeshadows are just stuck on my lids LOL. Although I really love the fact that this is gold based and has a bit of shimmer. It makes my lids brighter than how usual eye primers brightens my lids (or emphasise the shades). 2. Dentiste Plus White Toothpaste - I love this toothpaste but dislike the fact that it's expensive compared to other toothpaste. It has the right amount of mint that doesn't make you gawk when brushing your teeth. 3. Snoe Wash Away Those Zits Cleansing Acne Wash - this is a total waste of money. It doesn't work and it's freaking expensive. Do not be fooled by the layout design. This isn't the first time a product from Snoe didn't work on me but I keep on being victimized by the cute packaging. 4. Olay Body Wash* - I finished this in less than a month because it smells so good! I swear I used too much of this! Even L loves the smell of this! It did moisturise my skin but I don't think it whitened. Maybe I need another bottle of this? LOL! But yes, this beauty wash from Olay is awesome! 5. Purederm Make-up Cleansing Tissues - this is an effective makeup tissue remover. I don't know how much I got it for or if I even bought it or was given to me. But you can find this at any Watson's or SM department store. Lately, I find myself reaching out for cleansing tissues to remove my makeup at night instead of washing my face. I have about 4 sets of skin care that are still untouched. Que horror. 6. Too Cool For School Quick Tip Liner in Carbon Black* - I love how this eyeliner is intensely black. One line is enough to line your eyes as it is really opaque. However, this one smears on me and transfers to my lids if I don't apply an eye primer prior to eyeliner application. That's a total bummer for me. Don't even dare us this during summer as you can feel your lids being sticky when you blink because the eyeliner already transferred to your lids. I never experienced an eyeliner this bad. I tried to stick with this eyeliner because it almost has all the qualities I was looking for in a liquid eyeliner (pen type, felt tip, intense black, and dries fast). But yeh, the fact that this ain't waterproof (or should I say oil proof) defeats all the reason why I like it in the first place. Anoher thing to set you back is that this retails for PhP795 of PhP895. I bet Tony Moly and Etude House has a similar eyeliner that's half the price. I agree with Dentiste that is a very expensive tooth paste and Snoe products are not really effective, cute packaging yes but effectiveness a big no. I like Snoe but their products are a bunch of hitd and misses. Mostly misses tsk tsk. I think I got it for PhP399. Totally not worth it. Ugh. Yeh, I like that it's a Filipino brand. Although hassle dahil hindi naman effective. I emptied and loved my Olay Deep Moisture with Honey Body Wash too! I was happy about how moisturized my skin was and not needing to put lotion anymore. I've heard a lot of good reviews about Dentiste. Might give it a try after I use up my Glee Green Tea Toothpaste.